This is a page for the second Mini Otter Super Cub build with a bit more detail than the first. The Start Of My Second "Mini-Otter"® Super-Cub, Trials Project. With all details of the build. 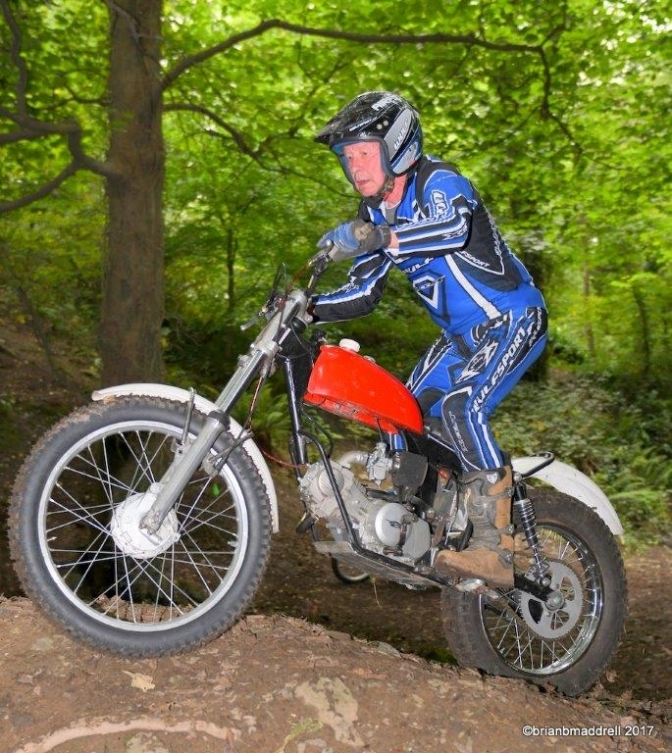 Brian Bedford riding the development machine in the Isle-Of-Man. OK not a very good picture but we have a start. All of the parts to the frame and the patterns you will need. 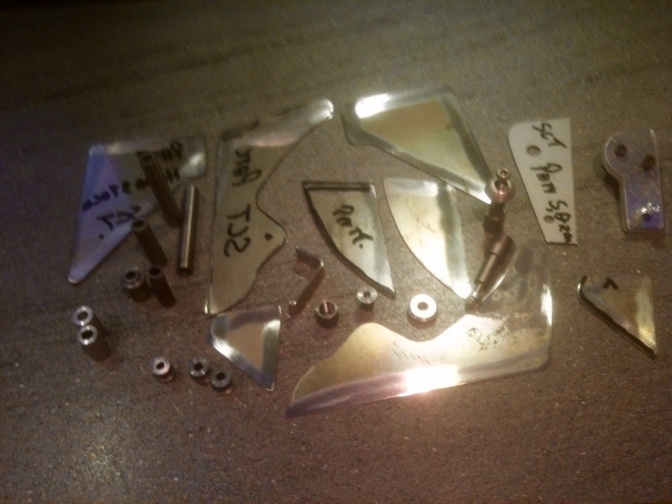 I may get these parts laser cut so that they will be in stock if you are interested? If you make these parts yourself you will need about two full days work and the use of a steel band saw, linisher, and lathe. in sequence so you can get an idea, of the time and work put into this frame. 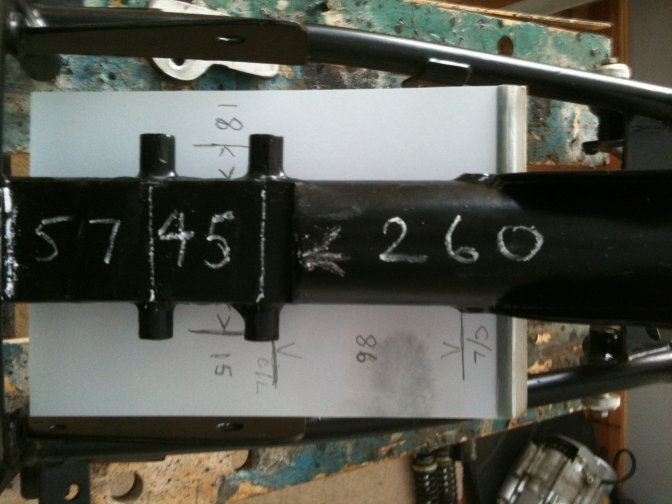 Here is the measurements for the holes and the length to the top tube. The through tubes were turned down from their original 14mm to 12 mm except for the 18mm that protrudes from the left-hand side, these were then dropped into the 12mm holes ready for Bronze welding. 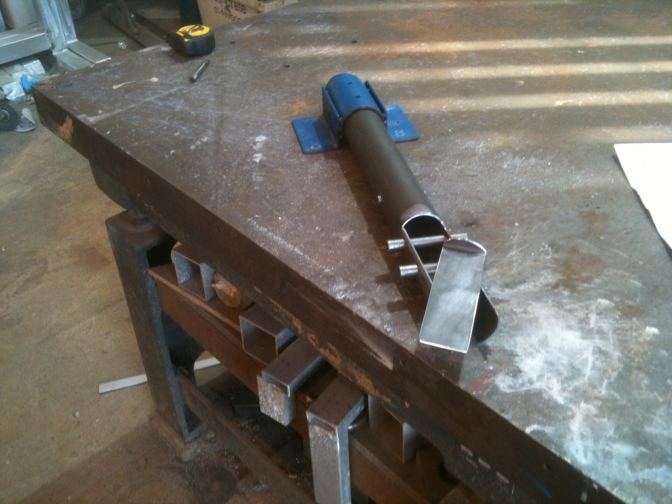 The flat section I gas welded into the tube before bronze welding the through tubes. 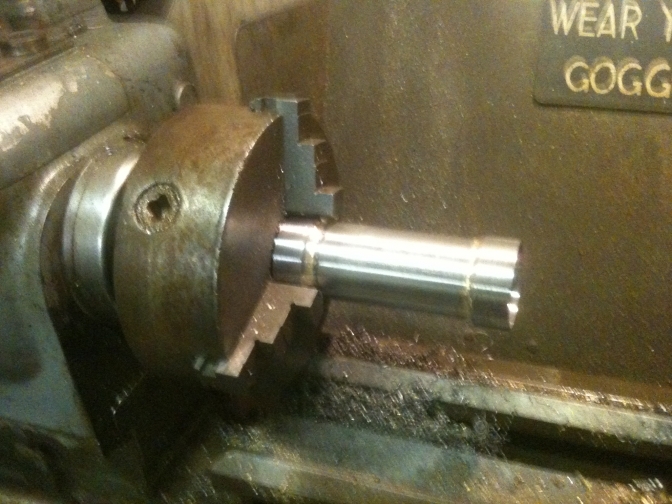 So I cleaned up and faced the steering head tube on the lathe. 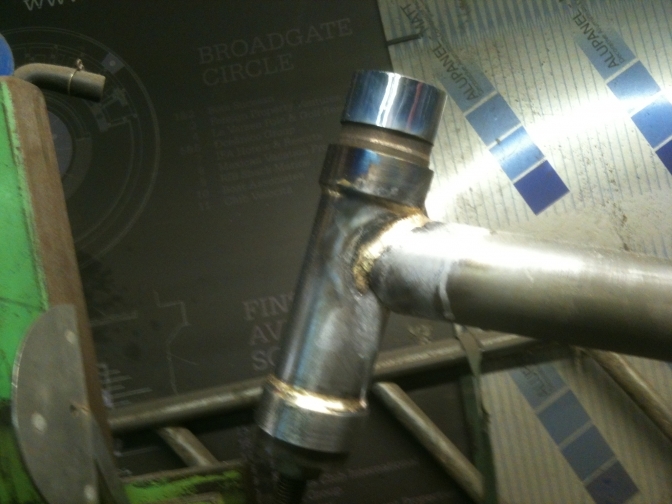 Then I bronze welded the cups to the tube, using a new jig I had made, and then cleaned the head tube up before setting it in the jig for Bronze welding to the frame tubes. 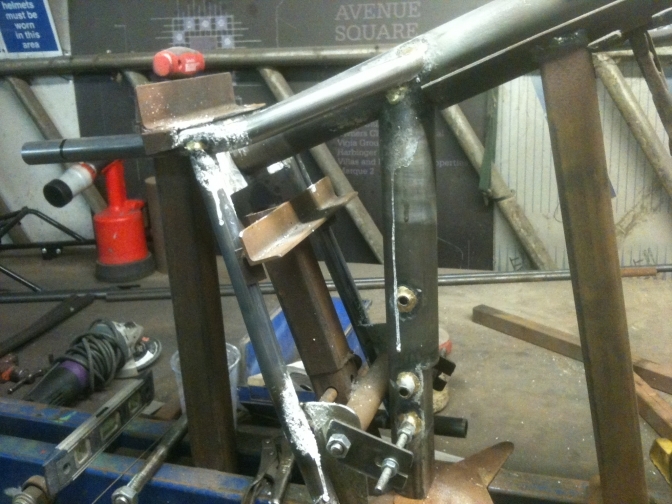 Now tack bronze welded to the main frame. And also the seat tube and subframe plate. More of a update tomorrow. This is the next stage on from the top picture, but before any of the gussets, ETC, have been attached. Upgraded to 7/8" tubing for the subframe, or seat tubes. this is the same as the "Hubbo" MM frame, and seems a better choice for the same weight. 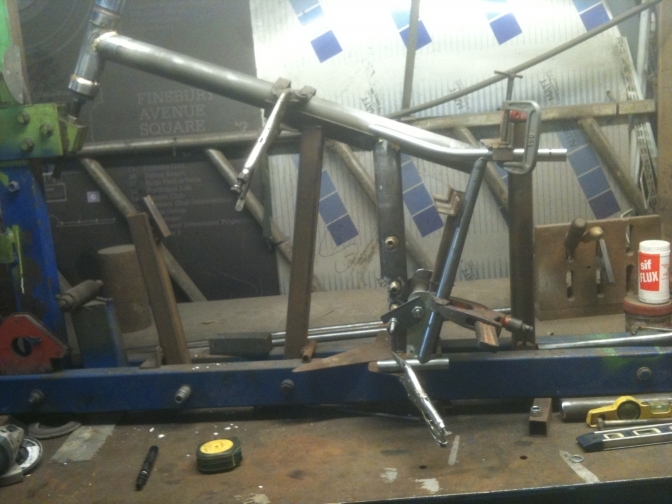 I have brought the engine carrying tube forward on this frame by eight mm. just for better swinging arm clearance. 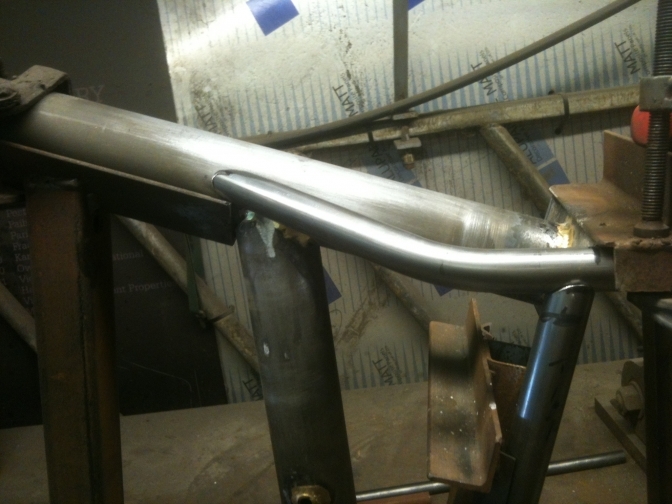 The same 7/8" tubing is used for the seat tubes. Using this size tubing brings it in-line with the Mike Mills "Legend" frames. The same size tubing is used for the rear bottom seat tube mounting, this will give more support,for the footrest, and give more room for attaching the brake pedal plates. So I turned the jig around and then duplicated what I had done on the other side. 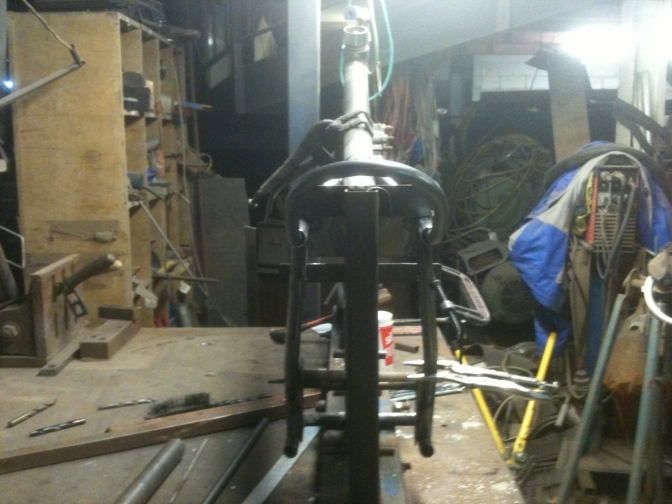 I then centred the seat tube ready for welding in the bottom brace tube. 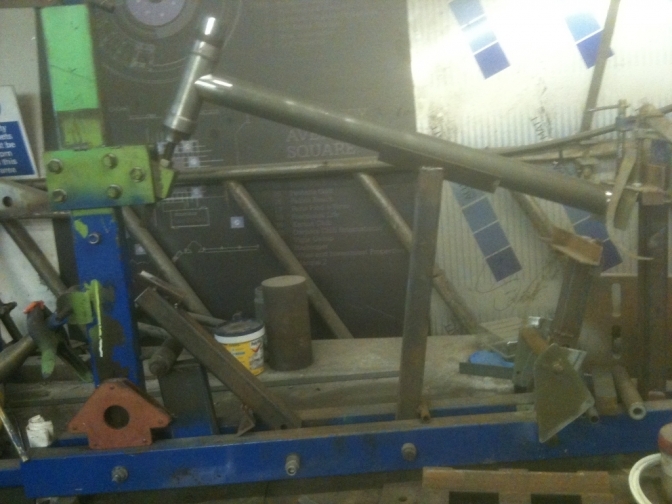 Both seat tubes now fitted ready for suspension mounts. So ready for mudguard loop and bottom brace today. 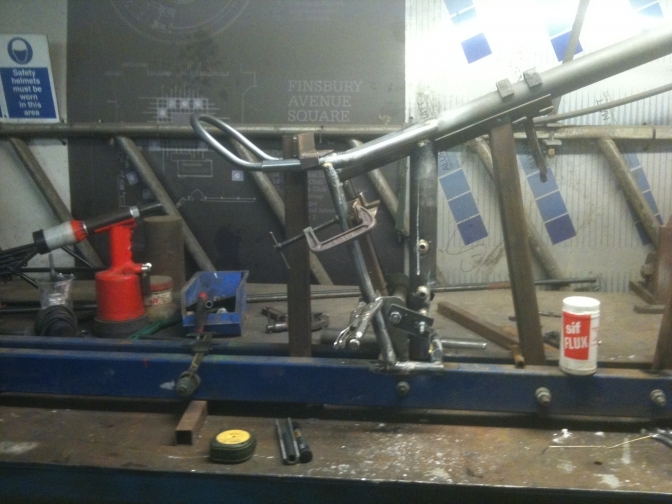 Yes 4 1/4" was right for the length from the seat tube to the end of the tube to the beginning of the mudguard loop. The mudguard loop ended with me having to make New tooling to bend the loop, but it came out better than the "Hubbo" original in the end, but could be better still if a proper jig was made. 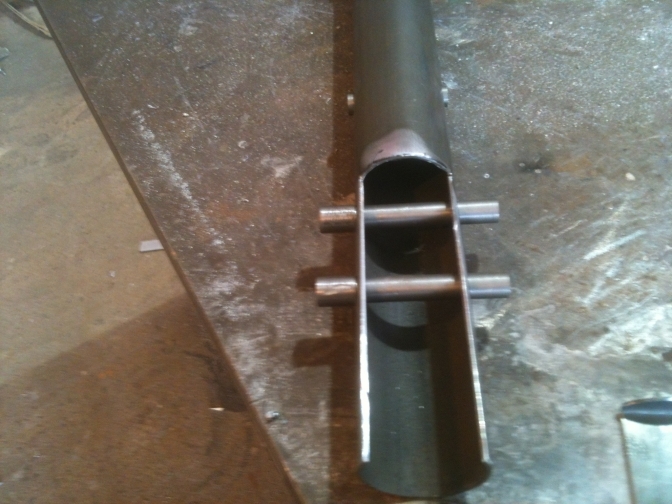 The tubes now fit the jig better than the "Hubbo" frame that was used to make the jig. 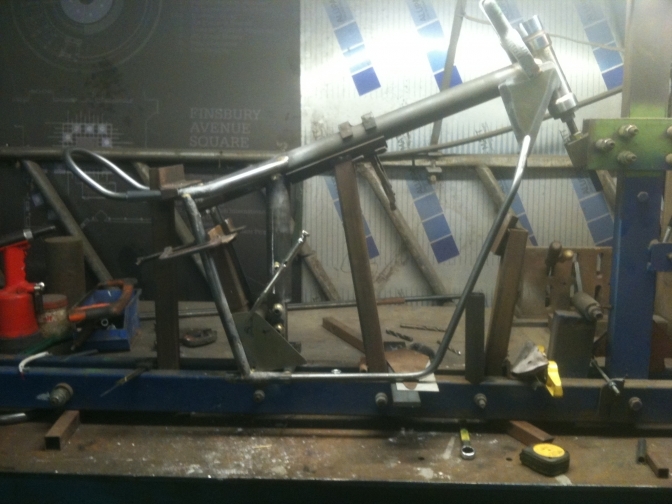 Then I realised that after measuring the "Hubbo" frame again that the measurements were right in the first place. 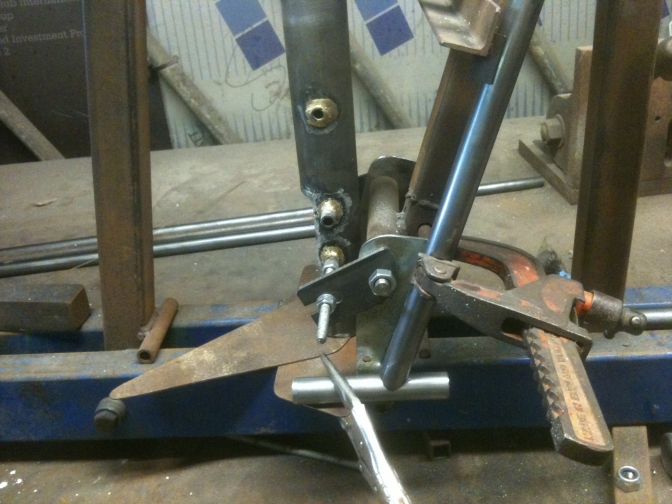 The seat tube itself needs squaring to the line of the swinging arm pivot pin to make sure the engine mounting holes are to the same parallel. 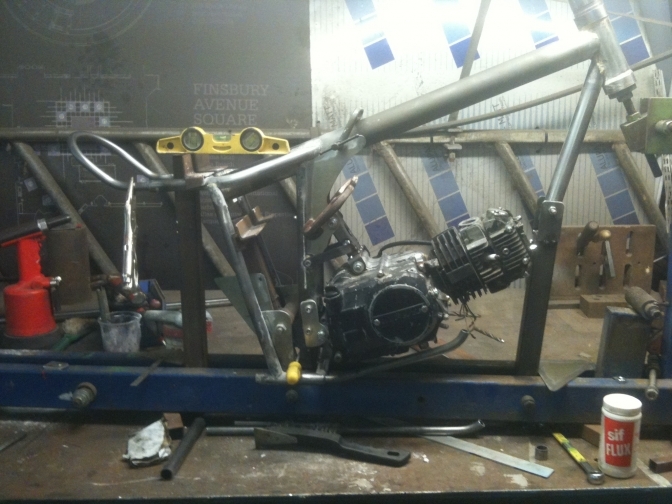 So the frame looks good so far, with a better fixing for the footrests and the seat loop right, it just remains to redesign the twin front down tubes to miss the engine cylinder head, but we will start that operation tomorrow, and I may not get it right at the first attempt now I have sacked "CAD" for a good eye. 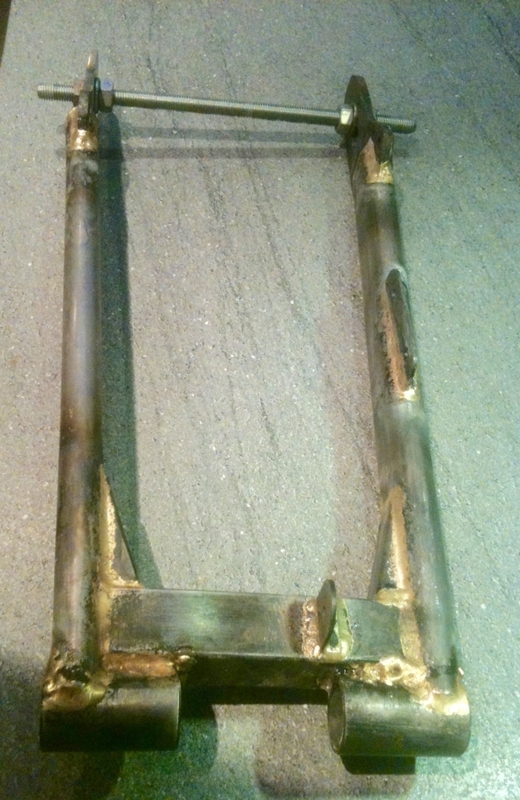 Sunday saw me bending the offside frame loop, and I thought it looked right, but was hesitant to tack weld it in place? I took the photos and left for home. When I looked at the photos I was glad I did not weld the tube in, It may look OK to you, but my thinking was, do I really need under-run tubes? 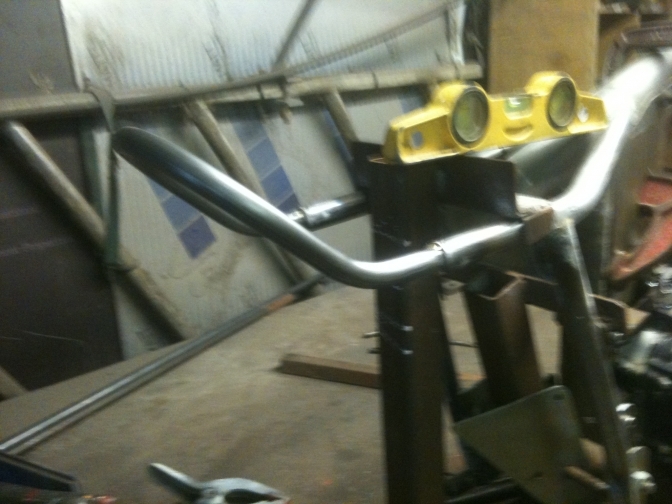 The tube looks good I must say, but will it restrict the steering lock? and it needs to be 9" wide to miss the cylinder-head. So Monday 21st August saw me make it into a proper "Mini Otter"
configuration by fitting a short front down tube of 1 1/4" T45 tubing and making up a through tube to bolt a engine mounting to, I intend to construct a structural tube and Alloy sump plate to take the bottom mountings and end with a front mounting to connect to the front down tube fixing. Why not just connect to the four cylinder head bolts I hear you say? well I could and have thought about it, but this part of the engine is not really structural is it! and the rigid mounting may cause problems. So What? 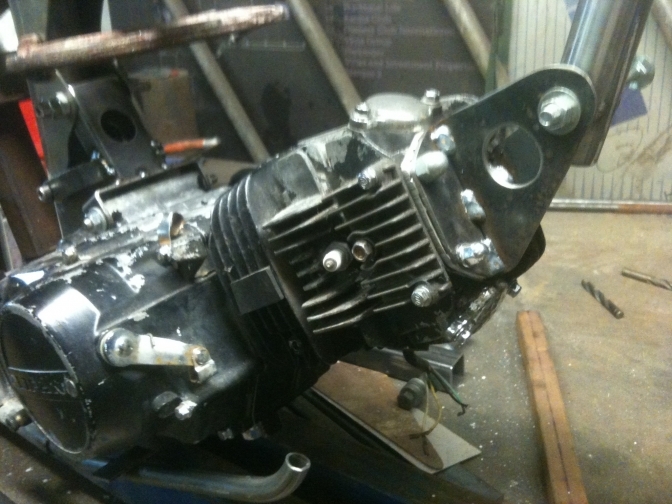 is the other thinking, the bits for the motor are cheap why not try it and see what happens? Well I may do. time will tell. 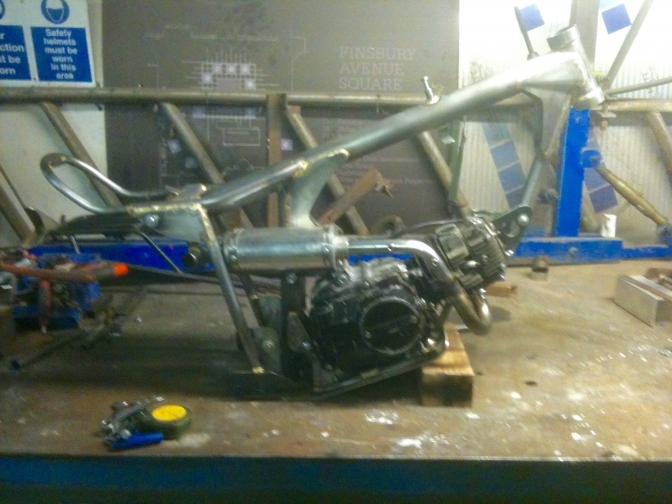 This is the spare engine for me to play with, the other NEW YX 140 motor is going into this bike. 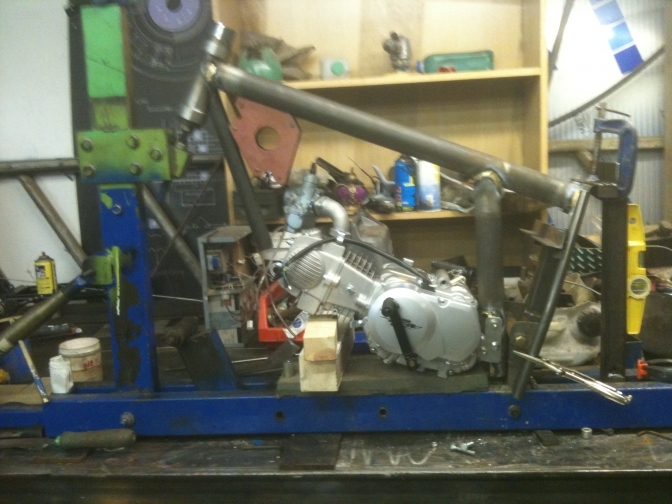 So with the engine now mounted into the frame with the top mount that I made up. the front down tube did not look right. 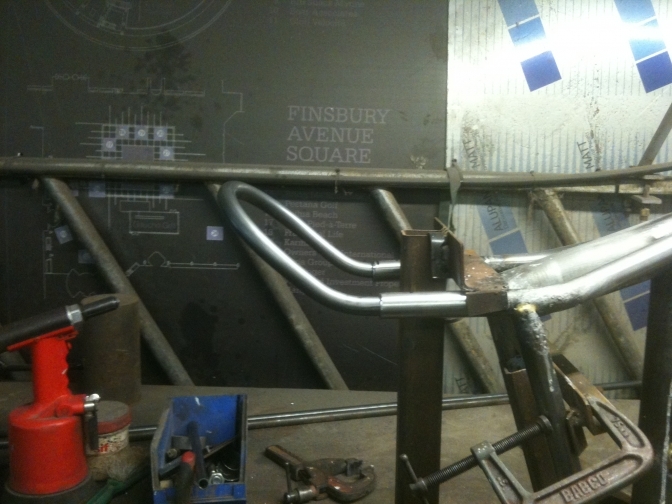 So I made up a new jig tube for mounting the front tube on, to get it right. 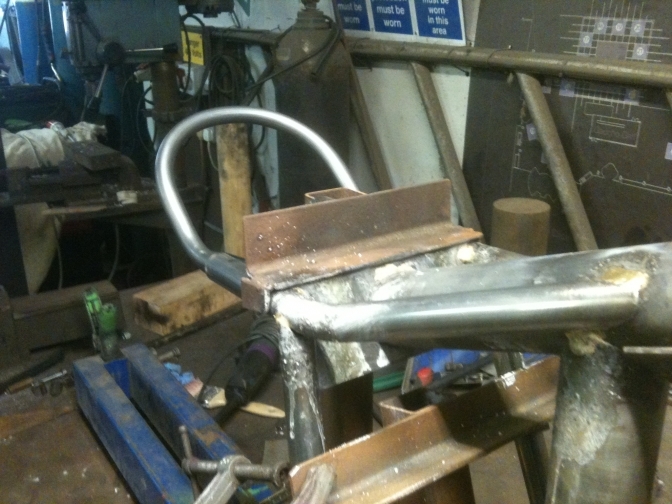 And then I tacked it and bronze welded the lot of the nearside with the jig pulled over to horizontal. While it was like this I made up two spacer collars on the lathe for the seat tube mudguard loop and bronze welded that too.... A better day after one forward Two back for the last week. So Thursday, I decided to go the ,"lets do the cylinder head attachment route", still dont know if I am right.? I looked beyond the "Trees" and removed the cylinder head studs and the rocker cover, and this is what it is. 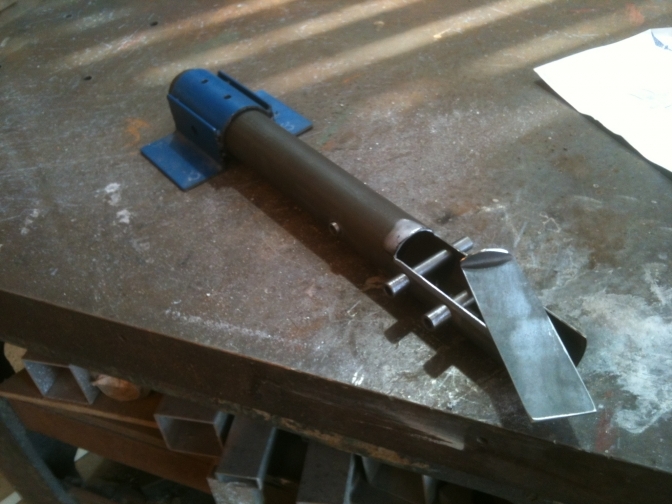 I then fabricated a new 2mm steel cover and then a tread plate alloy spacer to go underneath this. Tread Plate? well there is an air gap underneath the steel plate to dissipate some of the heat. so then new steel 2mm flange attachments were made and tig welded to the steel plate. And you can see, it turned out to be a good job. 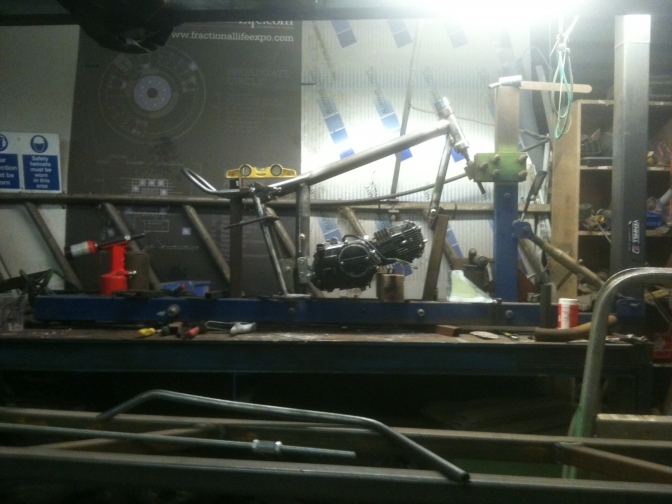 I then started the under engine attachment that will be part of the sump shield assembly. so not a bad day. I may try this little motor in the bike before fitting one of the New engines I have. Or may build another frame for it? 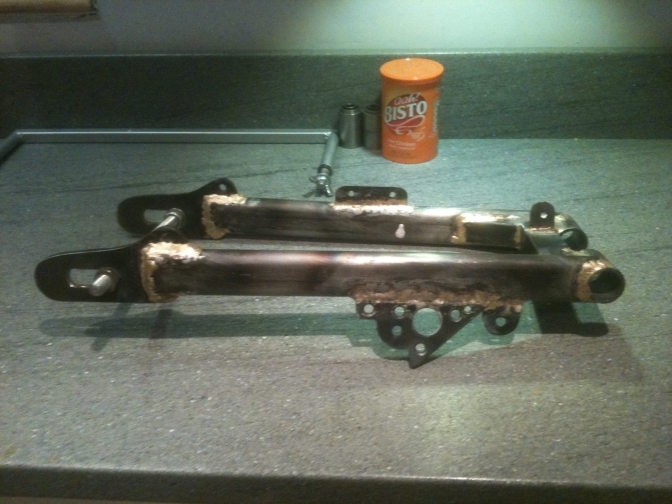 Yesterday I finally got round to bronze welding some of the joints. 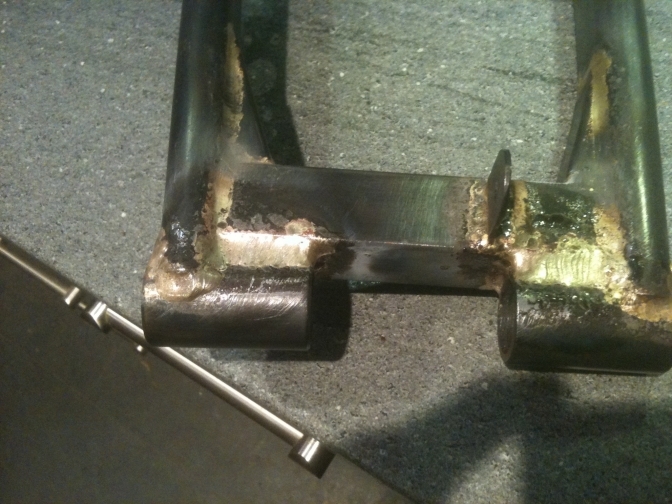 A good tip is to not think,"Well I can weld this joint". Don't until you have tacked the lot together and made sure you have everything right. 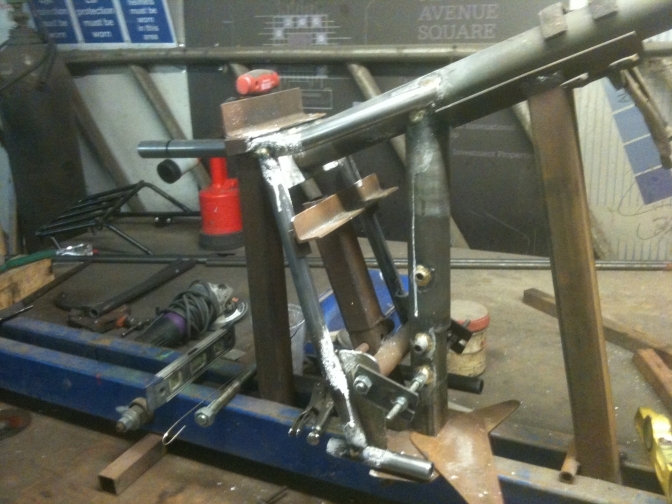 I finished welding the seat tube around the top before welding in the engine mounting plates,An as you can see left the frame in the jig, and manoeuvred that about. 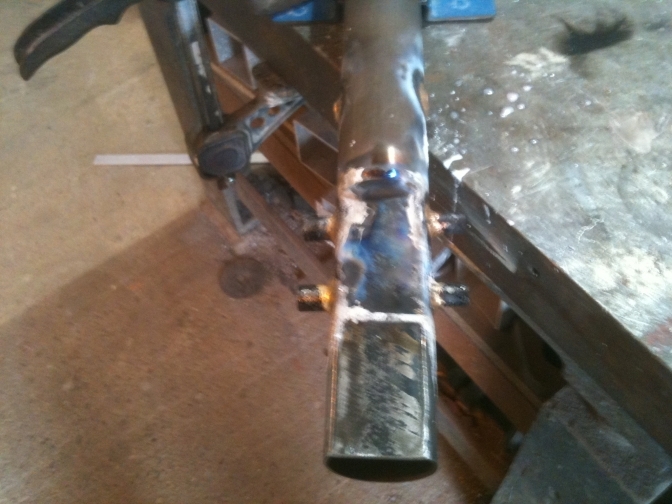 The headstock joints were also welded making sure it was a complete job, as don't forget the fuel is carried in this top tube. 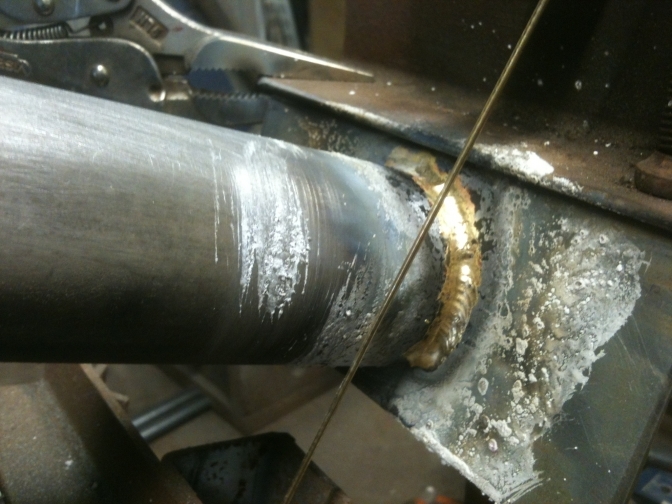 The hole for the filler will be drilled before finishing the back joint, so that the air in the tube can escape, otherwise it will blow back and spoil the weld. Days work complete and bench tided for tomorrow. 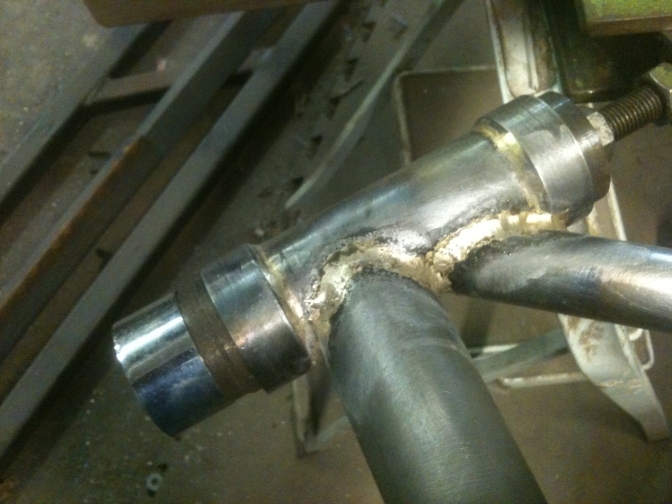 the seat loop made of the 11/16" tube was just pulled around a 5" former bolted to the face table, and then the two bends again done with the plumbers bender, and this was the hardest part to get right, to get the two bends the same. 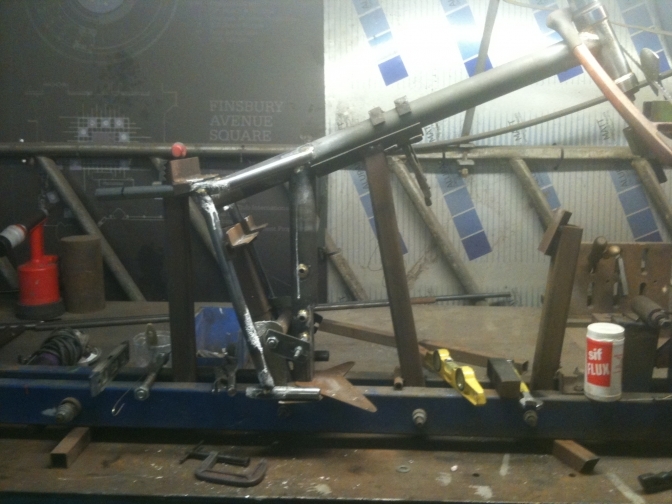 If anymore frames are built I will make a proper jig for this operation or get them bent by "Tube-Bender" at Rugby. 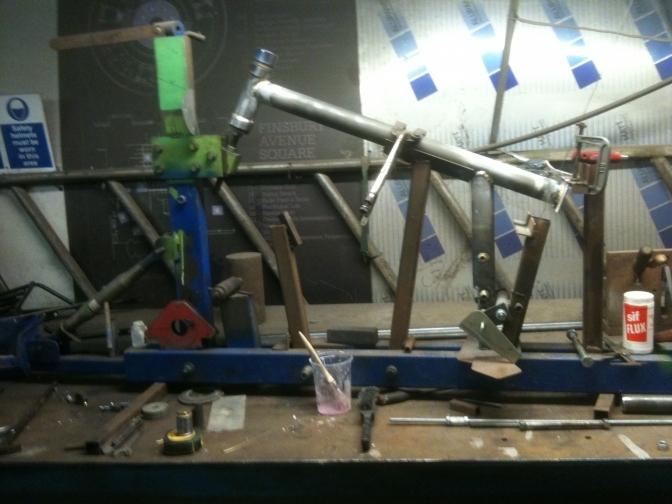 PS, the main tubes are in T45 tubing, but the seat tubes are just ERW on this frame so that they could be bent more easily, and the frame was for my own use. 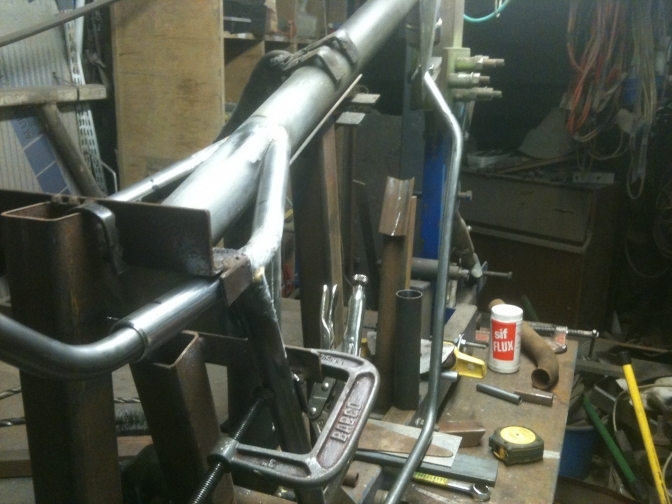 Any more frames and I would revert back to using the T45 as on the first frame and the same size tubing. as that. 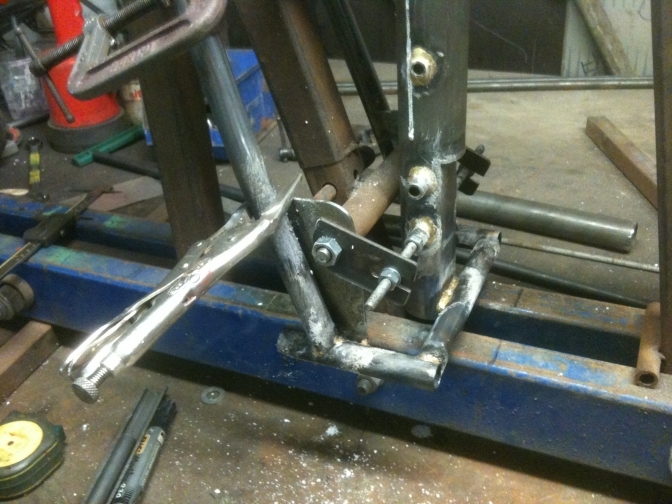 I am told Colin Seeley used all ERW tubing on his frames though? I played with the sump shield as well, but It just did not look right so I am now going to use a alloy plate right through, this will need a couple of alloy welded joints though. but these could also be bolted. OK here we are at the end of play on Sunday 27/08. 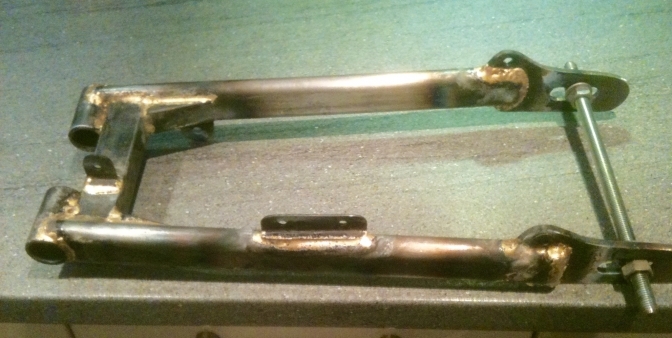 I have finished welding all joints, and fitted the flinch plates. I have also plum-pt for bolt on footrests. so have welded on plates to except these, if these don't work right I will again revert back to the original weld on pegs. I have finished the bash plate photos later. and we will see where we get too today. I have also had come to a decision not to put fuel in the frame to keep the thing more simple, but in the end have decided that it was stupid not to take advantage of using the top tube,then any type of cover could be used, and now Brian as designed an air-box to be fitted within the Ray Small GF tank,it needs the fuel in the top tube. I had been looking at one of my GF tanks and decided just to fit one of these, and the lay up would just be in polyester resin? well I am using ASPEN fuel in these little bikes, so there would have been no problems. So today after a bitter disappointed at the MGP 2017, I went to work and fitted the "Lifan" engine back into the frame to find where the exhaust mounting should be. I made New stainless steel bottom engine mounting brackets, and then had trouble lining up the New head steady mounting. 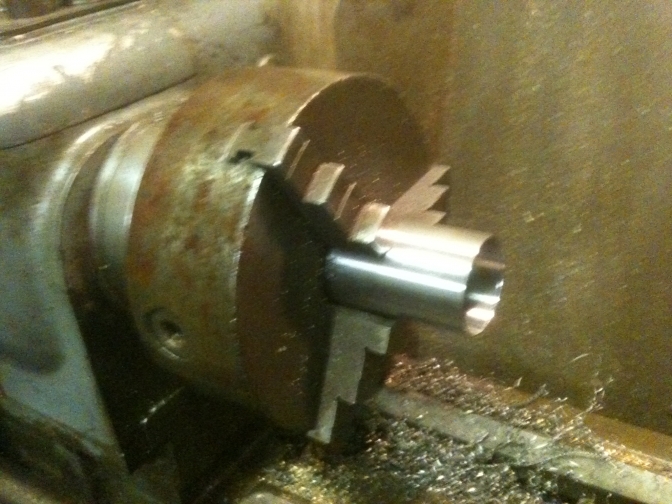 but this problem was solved with two new holes being drilled, and a bit of adjustment work. 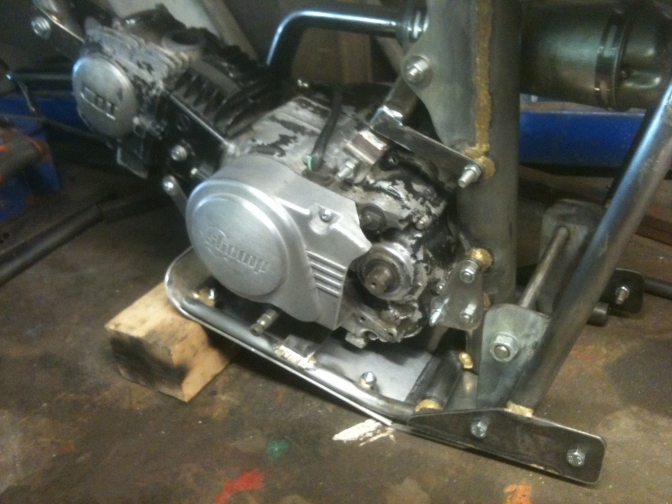 I finished welding the top engine mounting and fitted the engine sump plate and frame after again having to sort the bolt holes. I just don't like forcing bolts into holes, I expect them to be easy to fit. I am beginning to like this little bike just like the last one, and also have taken a liking for the engine, and now need to know what it performs like, do I keep it in this frame? or build another? We will see how we get on tomorrow. 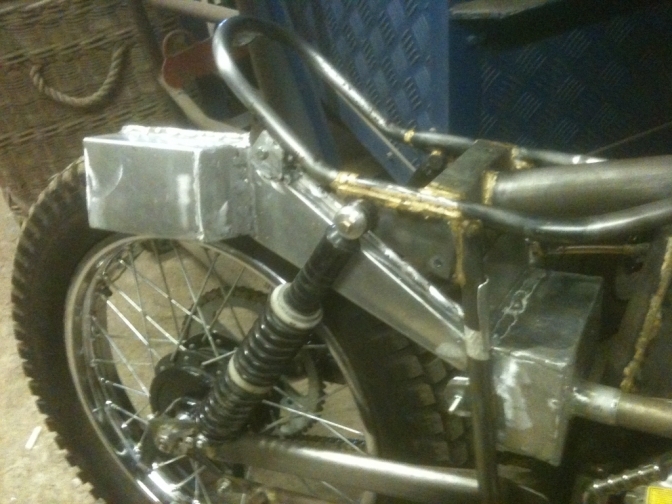 Well we have got on well today, and I have finished the tank and seat mountings. I have also fitted a bracket to take the ignition coil, just in front of the tank, so that it is in the dry zone but is still kept cool. 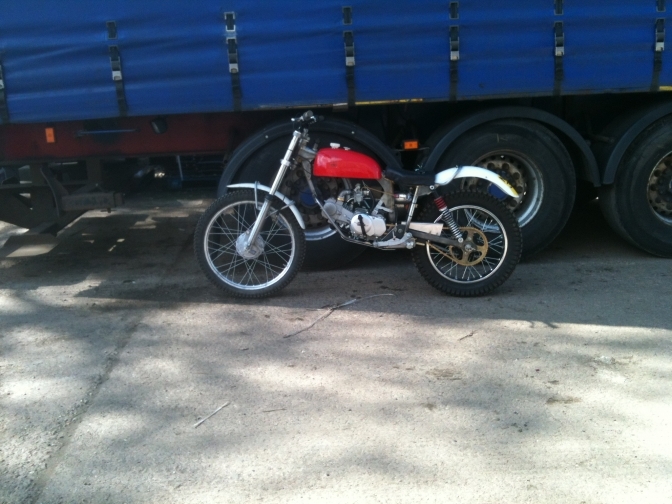 The 125 Lifan motor I am keeping and I have sorted a new gasket set, and service kit for the engine. So It looks like the New YX motor for this build. I am liking this project more every day. 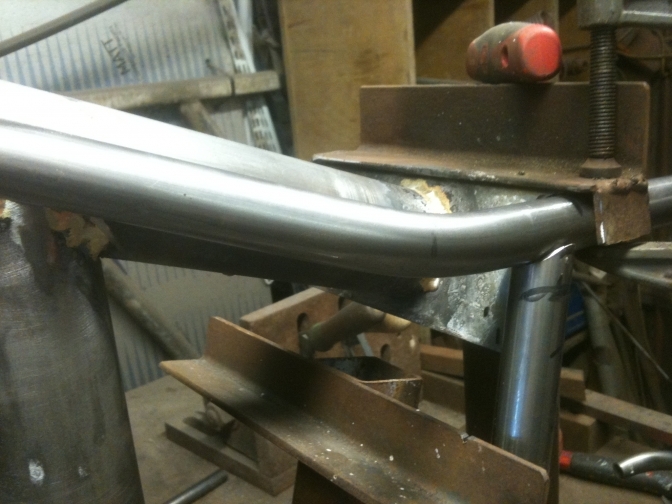 It had taken three four hour sessions to get the swinging arm the way I wanted it. 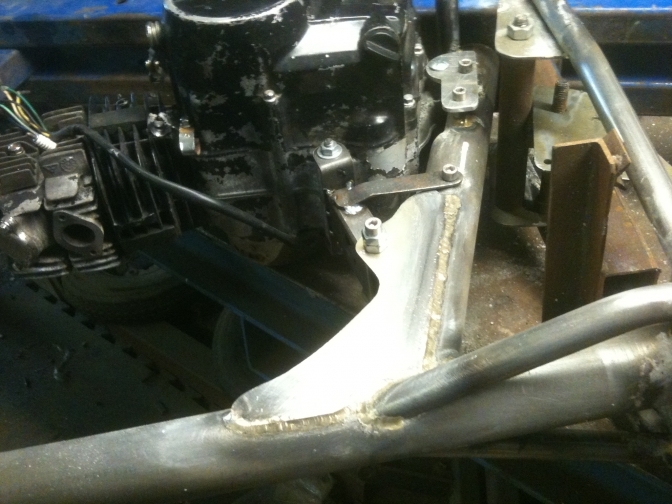 Has you can see I have altered this arm to the one fitted to the first "Super Cub",I have gone back to the "MM" type layout and are using Metalastic bushes the same as used on Honda"s and some Pit bikes. There was nothing wrong with the one fitted to "Mini-Otter" SuperCub "One" which was fitted with turned up Nylon top hat bushes, and we will go back to that system. But just a case of knowing I have to use these Metalastic bushes on the Foster Otter builds, and thought it a way of trying them out on "Mini-Otter" Two. It seems to have worked, because after finishing welding the under side, and releasing the tension it has sprung back into the correct width 7". Yes I have got to run the right hand taking weld in on the bush carrier. 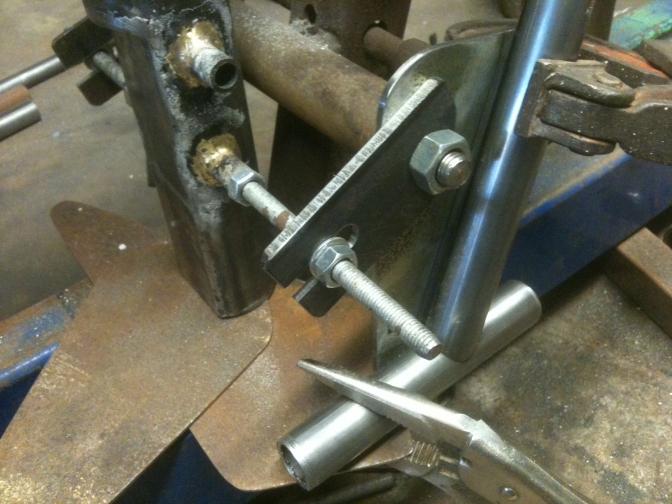 The heat was dissipated into my solid jig and made the joint a job to weld with a number 5 jet. 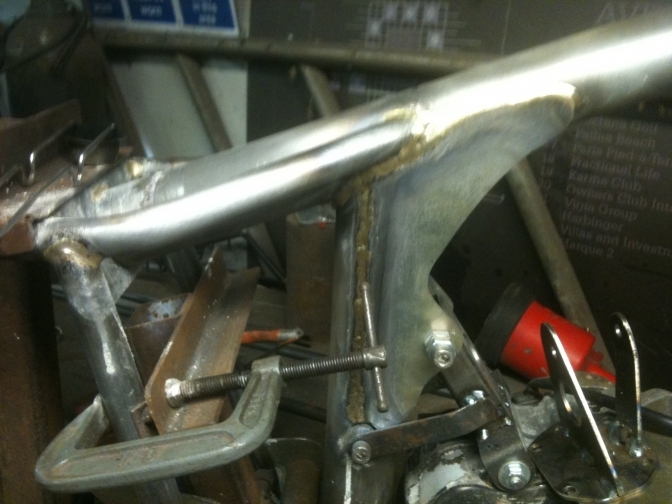 I think if anymore "Mini-Otters"® are built by us I will Mig or Tig weld the swinging arm assembly. I have dressed the bush holders ready to press in the bushes after paint. 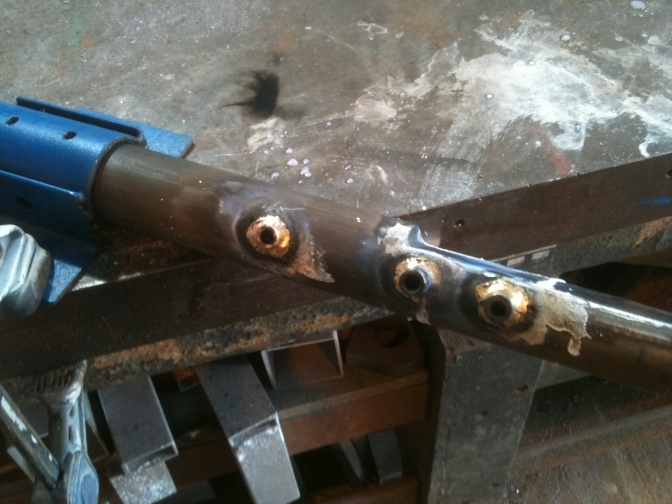 Re-welded joints with number 10 jet fitted. 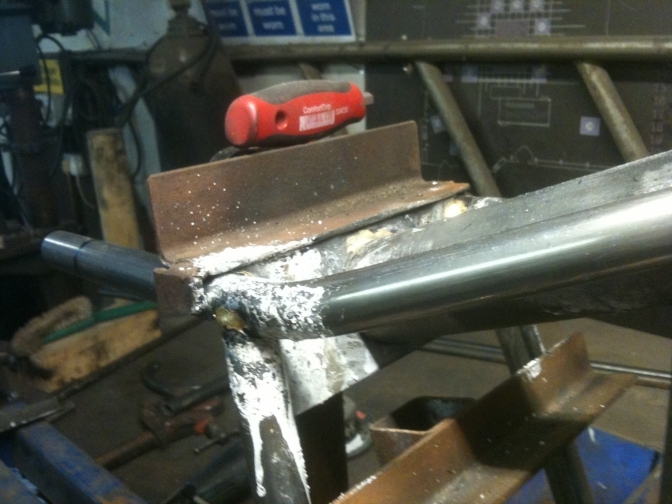 And then I welded on a side stand pivot bracket, Ahh Bisto. 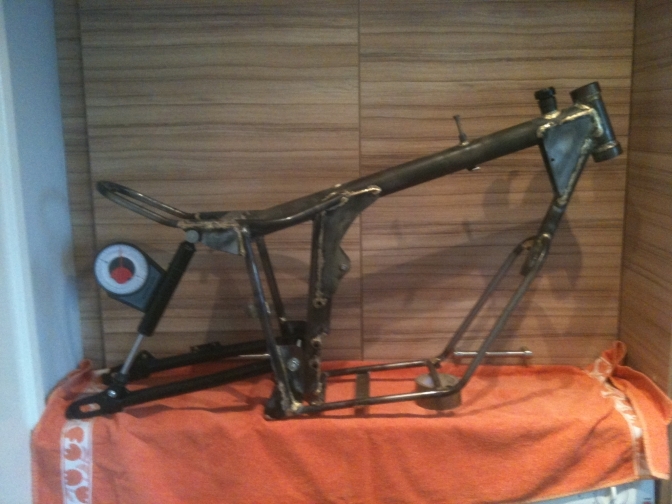 This is the frame you should end up with.The steering head is the same as I use on all of my frames and the same dimensions as the Faber frames, this takes the L44643/10 tapered bearings used with the 1" stem of the BSA/Triumph "FourStud" forks. Sitting below this is the filler Cap and neck, NOT for oil in this frame but for the fuel. This little machine will be running on the Aspen 4T fuel, and the Glass-Fibre tank that will be made fuel proof will be made from standard polyester resin. Filler cap details below, a breather pipe will be incorporated into the neck. This cap I machined from Black Nylon, but you could use a 1/2" BSP brass filter cap and the appropriate steel jointing tube if that is all you can get without the use of a lathe to turn this up. I am going to stick with the YX 140 motor unit for this bike too. We know the motor works very well in the first SCT, and we also now know how to tune it to our liking. Here it is in its delivery box. 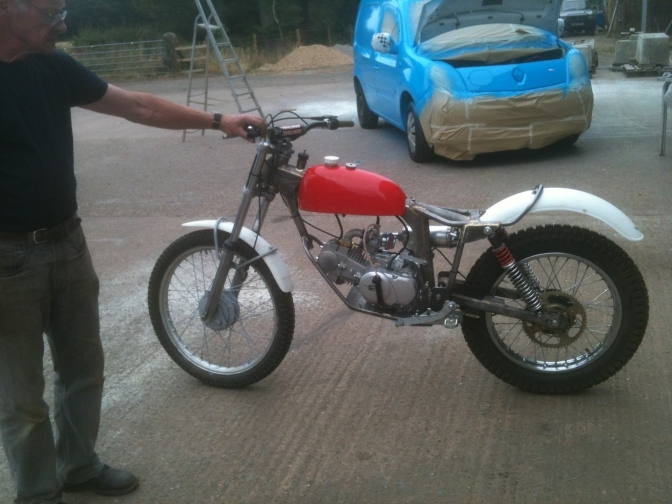 Brian has been over for ten days in July 2015 and with the picture of a Seeley Honda and some data from a a friend of mine. We were waiting for a new front pipe to be delivered ,but it failed to turn up,so as Brian had to return to the IOM,we had to coble up a front pipe to see how the New exhaust performed. the job looks good for the future, and the system only needs tidying. The cobbled up part is in Red. 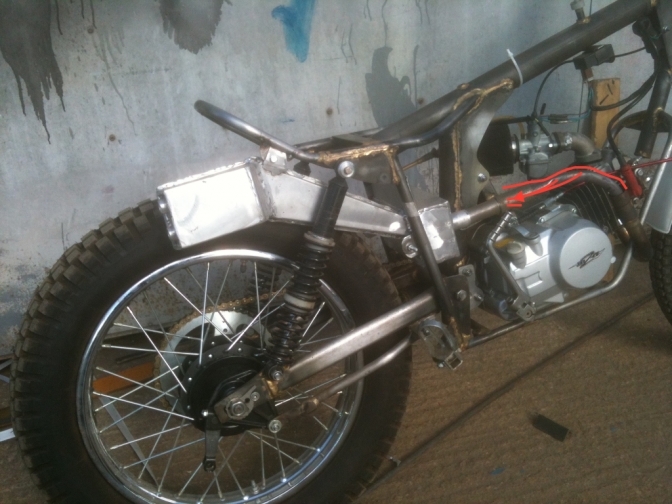 We only fitted the parts onto the First bike that were needed to ride it for a trial run and this is it. 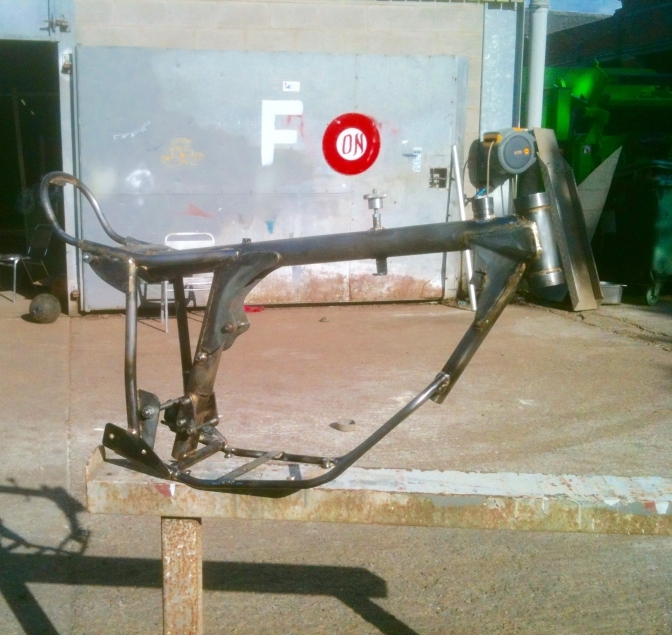 The first bike had been stripped down ready to paint the frame so an hasty rebuild with the necessary parts to get it mobile were used. The welding will be tided up with a Tig, we only had a Mig to weld it and it was a bit hot. 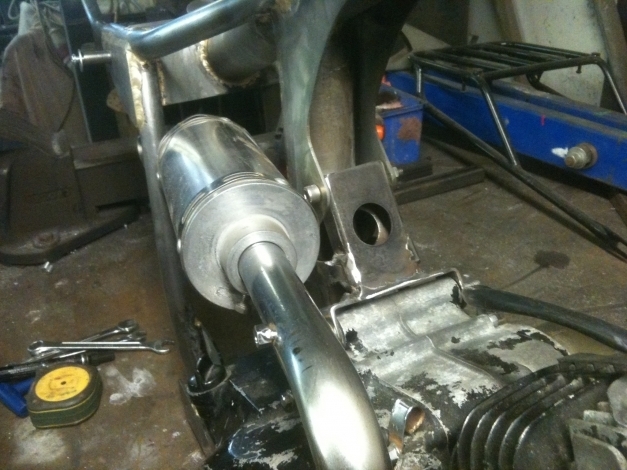 I will create the front pipe out of 29mm Stainless tube. 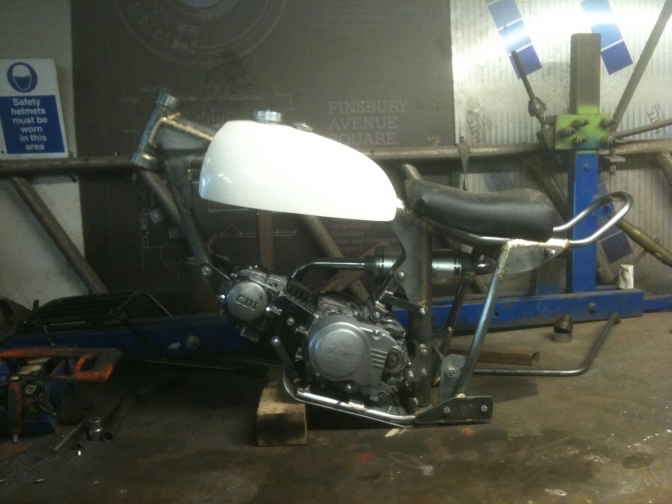 More on the build has we progress. This Now New page will just be about this second "Mini-Otter" SuperCub, Two build. And there could be another on the way? Here is the Jerred Honda frame has a comparison to how close the "Mini-Otter" SuperCub, frames turned out looking the same and I have only recently had this frame photo as you know. July 2018. 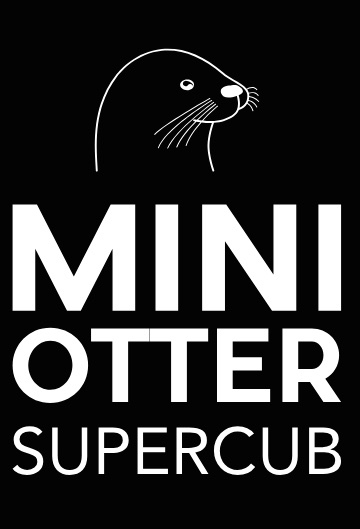 "Mini-Otter"® SuperCub, trials machine specification. Frame, Mainly built of T45 seamless tubing with exception of the rear frame mudguard loop, and engine under-run rails that are mild-steel ERW tubing. 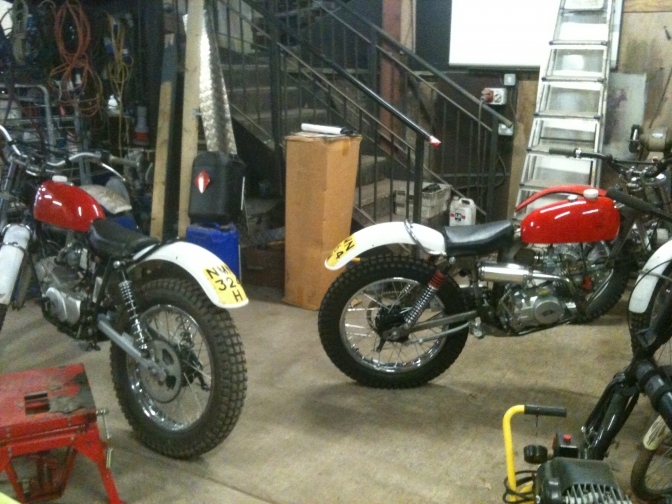 Forks, are 1971 type BSA/Triumph so named Four-stud forks. the other alternative is Yamaha TY or Gas-Gas. 38mm forks. Front Wheel, SH Yamaha TY 175 or New Honda C90 Cub hub and new stainless or alloy rim. Rear Wheel, Jialing JH125L, or copies of the same, Steel WM3 rim. Tank (Cover), Ray Small type glass-fibre polyester tank, or air-box modified version. Tyres ,What are available at the time. 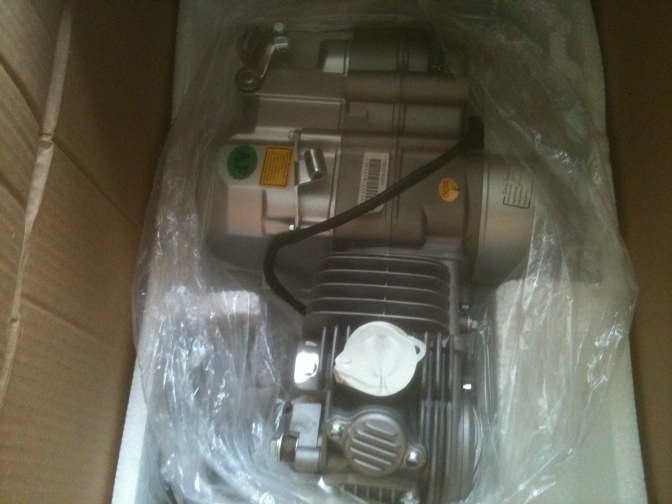 Engine unit, as standard, YX140, or Zongchen 145, at slightly greater cost. Guards Gonelli plastic (White) or grey alternative. Bar's, Renthall 7/8" standard trials. The specification may change,after development. 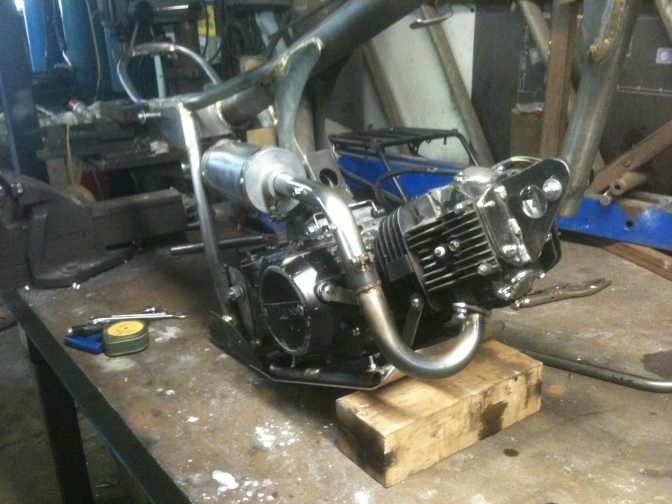 Well Mini-Otter Number two is finished and gone to the Isle Of Man with Number One, so that Brian can get it running correctly, and test the little bike, he will then register it in the IOM as a Mini-Otter. Photos below. 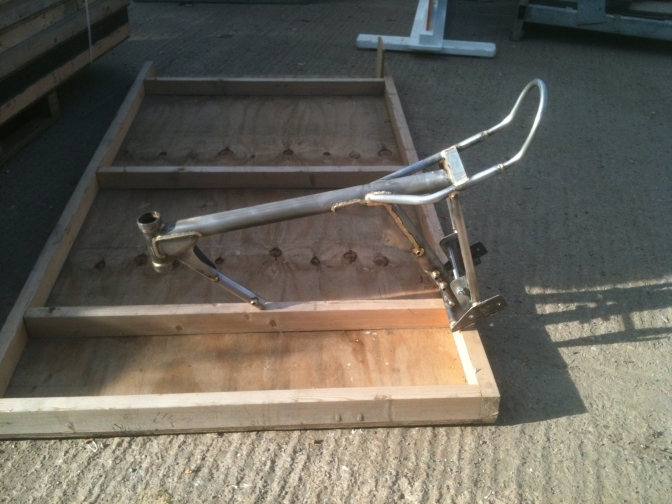 The frame now has detachable under-run rails to the frame. 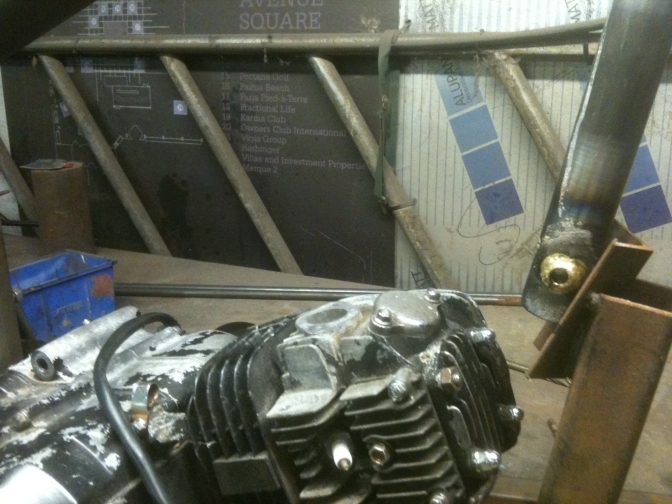 I tied with the idea of making the cylinder head bolts the front engine fixing and then carried out the operation on the S/H Lifan engine while it was in the frame, but the frame sat in my conservatory from last autumn until now August 2018, and the more I looked at the system the more I disliked it. I said I would make an effort to get "Number Two" finished. I had most of the parts by now, and had to make another tank cover for the first Mini-Otter' to cover the new air-box Brian was constructing, so I could use the tank from that bike on number two. 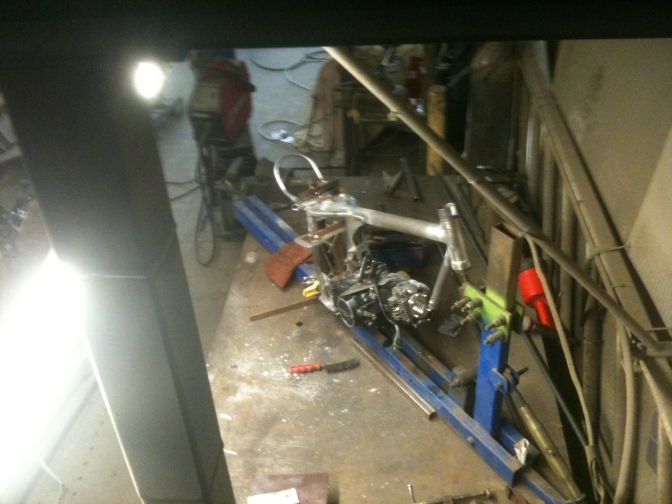 The weekend before the one Brian was meant to arrive, I took the new engine and frame to the workshop , and over the two days got the new under-run frame and skid plate fitted along with the Footrests, purchased from Mick Ash as usual. During the rest of that week I fitted the bushes into the swinging arm, with the aid of a blow-lamp, to warm the arm before pulling the metalastic bushes in with a puller, constructed of 10mm threaded bar and large washers. The new tank cover was moulded, along with a tank base that was part of the new construction. A new Jialing rear wheel came from stock, and two new wheel spacers to Brians specification were turned. I built up a pair of Triumph/BSA Four-stud forks from my dwindling stock, and just managed to find all of the parts necessary. I have to start buying again to replace what I used. A Yamaha TY 175 front wheel was also taken from the stores, along with the newly shod brake plate. 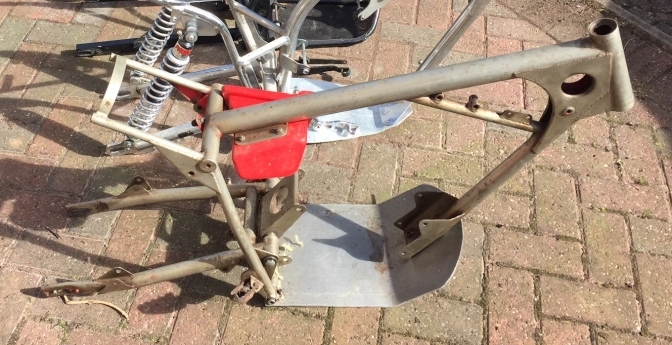 I then realised I was short of a front mudguard bracket so used the Triumph Adventurer pattern I had to construct one of these, I would have bought one from Feked, but thought I may not get it in time. So Monday Morning Brian was due to arrive, but the journey from the ferry at Liverpool and down the infamous M6, meant that it would be Tuesday before he could weald his tin-snips and riveter. for the air-box construction. I basically spent the day sorting him,so it was not until Wednesday that I got to start assembling 'Mini-Otter" number two. 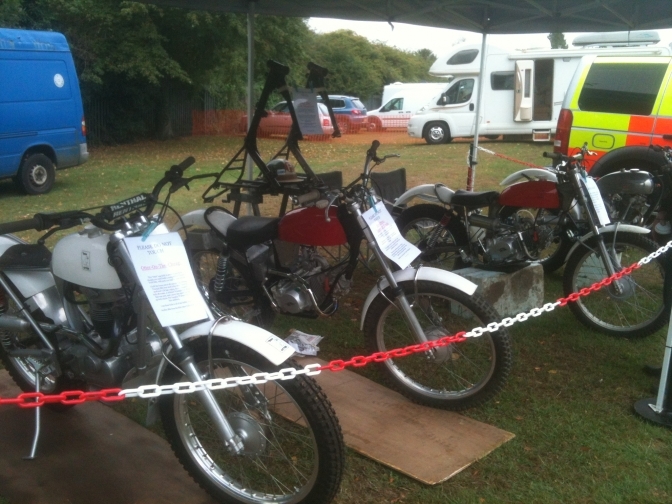 And on the stand with the other Otter Bikes. Write up of finishing the build later. 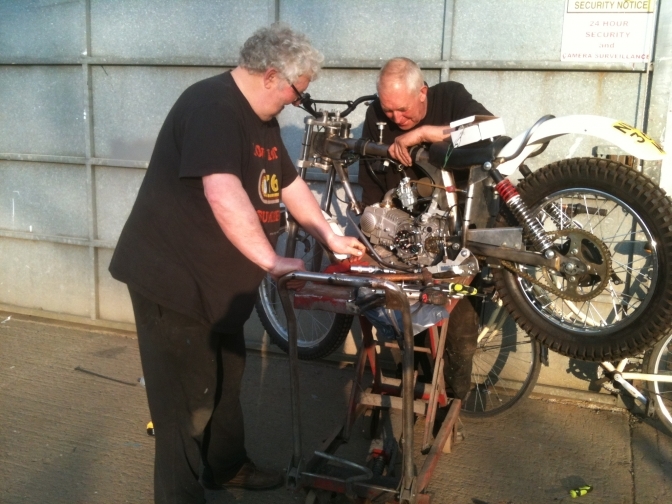 While he was over here Brian fitted a larger ignition flywheel to bike one, and the extra weight seemed to make a difference to how the engine ran.. So I ordered the same size alternator for number two. but it was a different story on the second engine. 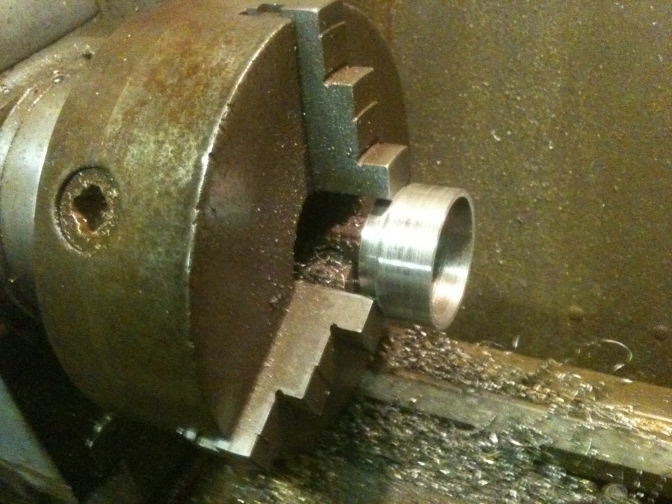 I then spent half an hour making a flywheel holding tool. two in-fact, and roped my brother and Alan in to give me a hand . Don't forget the ten minuets Brian had taken.. Us Prescott's don't give up, and this nut was coming off. "Fetch the 3/4" rattler" my brother said to Alan. 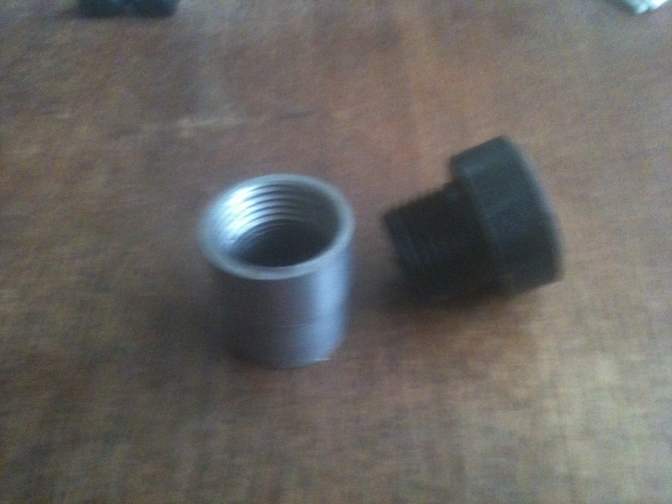 the one used on truck wheel nuts..
meanwhile brother manufactured a socket drive by welding the 14mm into a three quarter drive socket. A couple of rat-tat-tats and then that werring noise that you hope for, the nut was off. The next problem was the two cross head screws that retained the alternator backplate.. these would not budge either and broke a cross head socket that was guaranteed for life.and meant a trip to Halfords to replace it. Screwdrivers with grips attached were tried.. with no result. I said I had an impact driver but this would need an overhaul to work... another half hour. Brother got out the lump hammer and we found a socket with the right cross section.. after lumping into the engine for what seemed like hours the first one moved and the same time with the second. I fitted the new set up back on in five minuets but could not get a spark,plug I think as Brian had pinched the new one from the motor.or was it me? So more later. PS. Andrew brought his De-Walt impact driver down to my house for number three and we got the nut and screws out in two minuets but they were just has tight. More on the build later.